We have used the term Sulmona trail to refer to all the events that take place in the area of the town of Sulmona, in the Abruzzi region of Italy. The trail takes place annually at the end of April and is now organised by the Liceo Scientifico. If you would like to participate then please contact ELMS and we will put you in touch with the organisers. 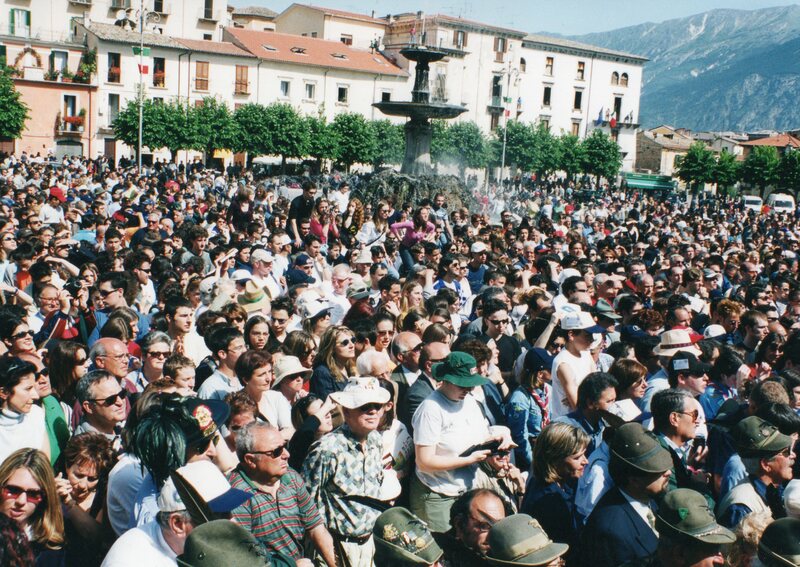 When 627 walkers, led by the President of Italy, Carlo Campini, marched out of the main square in Sulmona at 11am on the 17 May 2001, the first San Martino Freedom Trail had begun. It was the culmination of two years of inspirational and meticulous planning by Roger Stanton, the British event co-ordinator, also to a lesser degree by Keith Killby and Steve Sims of the Monte San Martino Trust (MSMT). 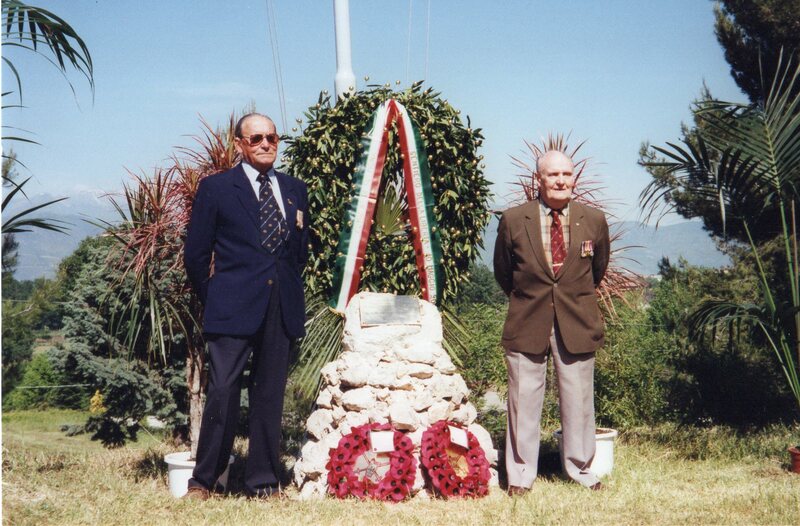 Enormous efforts had also been made on the Italian side, initially through Professor Pelino and the Liceo in Sulmona, and more recently masterminded by Major General Nino Fontecchio and his wife Anne. The Freedom Trail was named after San Martino (St Martin) who was clearly the most appropriate patron for the trail, and is also the Patron Saint of the MSMT. St Martins day falls on Remembrance day on the 11th November, and it was he who divided his cloak to clothe a shivering beggar, thereby symbolising the help given by the Italian people to POWs on the run. The purpose of the trail was to commemorate a noble chapter of Italian history which is too often forgotten. On the 03 September 1943, the Italian Government led by Badoglio (who had replaced Mussolini in July), signed an armistice agreement with the Allies. The armistice was made public on 8th September 43, at a time when many thousands of Allied POWs were still detained in POW camps throughout Italy. Despite the Allied order that all POWs should remain in their camps, thousands either escaped or marched out of the camps into the surrounding Italian countryside. Italy had lost many of its young men in its war against the Allies at that point and the Allied bombing of Italian towns and cities up until September had become increasingly intense. There was no reason for the many young serviceman who walked out of the camps to expect anything other than hostility and resentment from the civilian population. What they received was in almost every case the exact opposite. 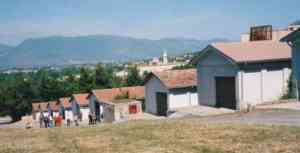 They were housed, fed, nursed and often led to safety by the Italian people of the countryside, usually the contadini. The motivation behind the help that they received was simple humanity. The price that the contadini paid was horrendous. Many were shot, either because of their involvement in helping POWs, or simply as a reprisal or deterrent, many had their houses burnt to the ground and what little possessions they owned were confiscated or stolen. In some cases, as in the hospital in Sulmona, not only were the POWs helped once they had escaped but also in the escape. 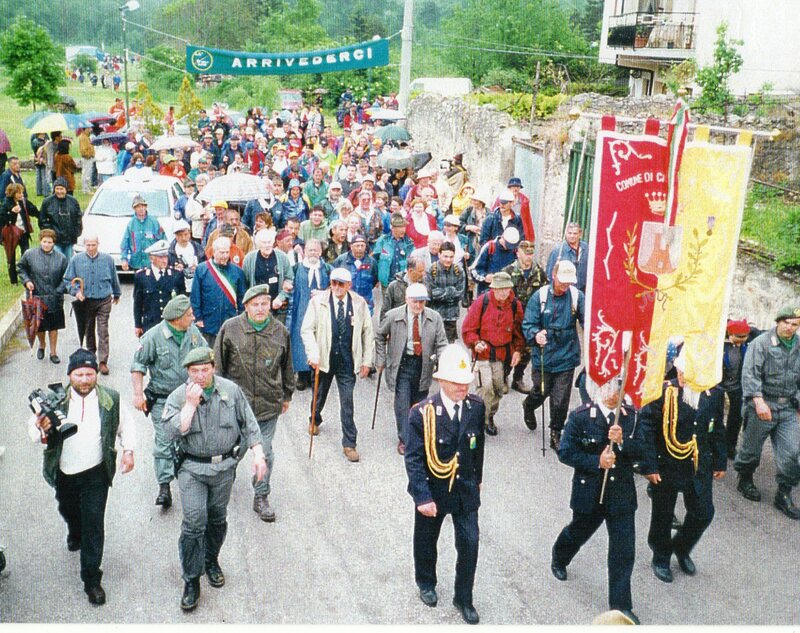 The purpose of the Trail, was to establish an annual event which would commemorate and pay tribute to the help given and sacrifices made by the Italian people in the Sulmona Valley and Maiella area where so many POWs tried to cross the lines. 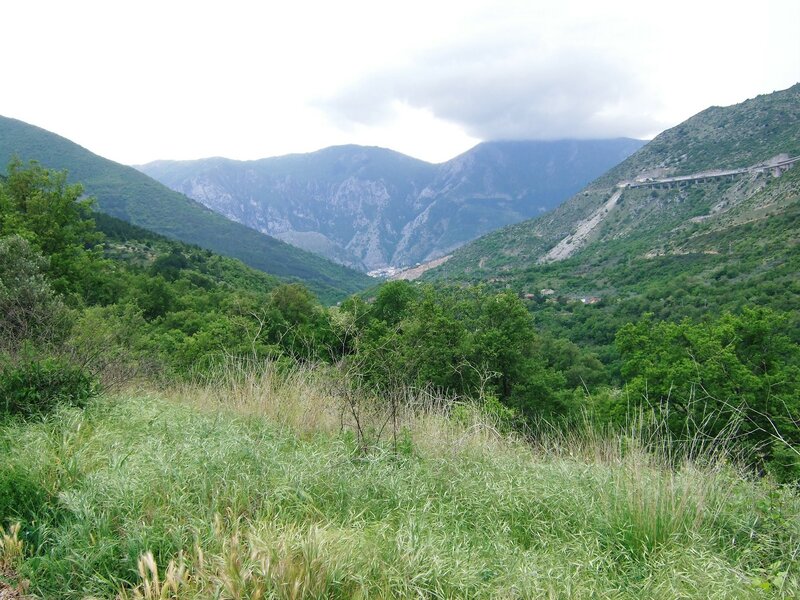 The route was symbolic, and led from Sulmona, the site of the prison camp PG78, through the mountains and villages to the River Sangro at Castel de Sangro which at one time was the front line between German and Allied armies. The meeting place for most of the civilians attending was the Europa Hotel on the outskirts of Sulmona while the military teams were billeted at the Liceo Scientifico. Others were accommodated in Sulmona. Everyone involved on the event rallied at the Europa and the hotel became the focal point for the week’s event. All 200 beds had been booked for the Trail. The peaceful town of Sulmona and the Europa hotel had never experienced anything like our visit before. Not only had the Brits taken over but also representatives from many other nationalities also attended. Most people usually only used the hotel rooms and ate in the town. It was now full English breakfasts and evening meals. The fact that the receptionist also manned the bar indicated that they had never anticipated the amount of trade they would have over the next six days. Many of us had driven from the UK with veterans in Vauxhall Fronteras borrowed from Vauxhall together with the support team headed by Steve Sims who was convoy leader, and we arrived in the early hours of Tuesday morning. The main body of walkers arrived by air to Pescara on Wednesday. 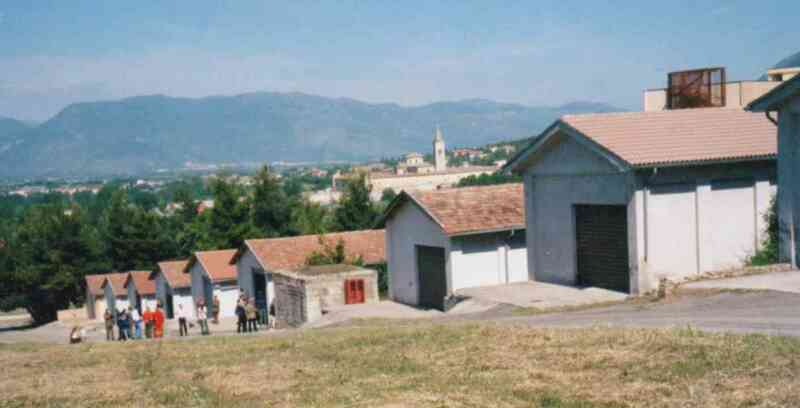 The early arrivals visited the old PG 78 at Sulmona where many of the original huts remained. Some of the ex residents of the camp had arrived early, Bernard Collier, Eric Holmes MM, Joe Drew MBE, Ray Sherk and Don McClarty (who had spent his 21st birthday there). Old huts were visited which still bore the drawings of the prisoners kept there. Many were regimental badges and crests, The camp was now used as a base for Italian soldiers on mountain training. An honour guard of Italian soldiers was present when we arrived and a wreath and crosses were placed on the camp memorial. Bernard Collier then gave a talk on wartime life in the camp. Later in the early evening there was a trail briefing for all the walkers, veterans and guests. Local dignitaries were also now arriving in reception. After the briefing Eric Holmes presented the Mayor of Sulmona with the official visitors book for the trail. The book was to be signed at the finish point by all who had completed the trail. It was leather bound with a brass plate dedicating the book to the people of Sulmona and the surrounding areas. Keith Killby also gave an excellent talk in the hotels conference room about the experiences of escaped POWs in Italy. The official walk began on the morning of the 17th May. 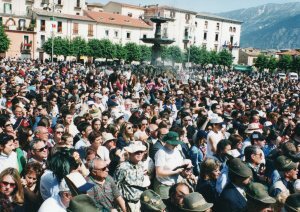 Everyone made their way to the start point, Garibaldi Square in the centre of Sulmona. The route chosen today was Sulmona (450m above sea level) to Cansano (835m) and finish for the night at Campo di Giove (1064m). Most of us got to the start point at about 0900hrs to await the arrival of the President of Italy, President Ciampi. The President arrived a little after ten o’clock and the ceremony lasted about half an hour. Keith Killby spoke on behalf of the Trust and Major Ian English MC and 2 bars, read a message from HRH The Prince of Wales. Speeches were also made by Professore Pelino of the Liceo Scientifico and by Domenico Silvestri, whose grandfather had led escapers to the Allied lines. President Ciampi replied, and did us the honour of leading off the walkers from the main square to cut the tape at the start line. We had started late and the morning’s walk was now in the very hot midday sun, nearly all up hill and for many walkers lasted until about 1530 in the afternoon . The route was rough pathways, white roads, rough ground and rocky in places. Very dusty, mainly open ground, and very hot. On arrival in Cansano there were hundreds of people packing the square to meet the walkers. Because of the late arrival in Cansano we only stopped for a short time, replenished water bottles, and headed for Campo di Giove. Starting by road, the route again went uphill on rough track and lasted about an hour. On the edge of the town we were met by the town band and we all marched into the town square behind it. Many touching reunions took place in the town. An Italian lady appeared with a very old photograph of Allied servicemen whom she and her family had helped. She was looking for the men in the photograph. To her delight she found Don McClarty and they were reunited. At the camp site the Alpini provided an excellent supper for all. During that first night on the trail many new friends were made and old friends reunited. The dining room conversations were fascinating. One lady now in her nineties, who, as a young wife was collecting fire wood in the mountains when she came across a crashed Allied plane; two of the crew were dead and the third badly injured. She took the injured airman from the aircraft and carried him down the mountain on her shoulders! At her home she nursed him back to health and later saw him on his way. She and her family never saw him again. They only knew him as Julian. The weather was again very hot. The walkers were all ready to go by 0900hrs. The route had a gradual climb from the village (1064m) and then climbed straight up to the Guado di Coccia (Coccia ridge 1652m). Most of the steep route was a very acute slope of the ski run which was perched on top of the mountain. It now turned out to be a real slog in the heat with many stops along the way. We reached the top and had a much needed rest. The Alpini kindly provided a picnic lunch. After lunch there was a memorial service to Tenante Ettore de Corti. De Corte was a young army officer from Udine who was caught with others in the pass at the top of the mountain where we were having our lunch break. He was escaping with his companions and trying to reach the Allied lines in October 43. Surrounded by Nazi troops his unarmed companions surrendered. De Corti had a revolver and refused to surrender. He fought and was shot and grievously wounded. He was left for dead. He survived for two days until the Germans returned and shot him in the head. He was later posthumously awarded the Italian Gold Medal for Valour. Crosses were laid at his memorial. After the ceremony it was all down-hill with difficult walking through rocks and a large boulder field which eventually lead to Palena (767m) for our night time stay. During the late afternoon a “POW Forum” was organised with the veterans answering questions on life in Italy during the period after the Armistice. Wreaths were later laid and supper was served on the camp site. Earlier in the day a tornado had hit the camp and wrecked many of the tents. Thanks to our ground crew under Steve Sims and the local scout organisation, all under the co-ordination of Major General Fontecchio, supper was served on time and all the tentage was back in place. The weather had now changed dramatically. The hot sun had been replaced by rain, cloud and mist. The walkers now needed to be closed up and keep together. To add to the weather we were now passing through the wild bear reserve which is a feature of the Maiella National Park. The scenery was believed to be beautiful but we could see little but mist. We stopped high in the mountains for our lunch at the Fonte Del Pulcini picnic area and then continued on to the small town of Gamberale (1319m). The going was undulating, wooded and rocky at times, although on most occasions we were on tracks. We heard bears but saw none. At Gamberale there followed another ceremony where wreaths were laid. Another forum took place in the evening during which the son of the man who had smuggled clothes to Eric Holmes in hospital at Sulmona made himself known. An emotional reunion took place. Later more TV interviews with the veterans took place on Italian television. Walkers were now getting nearer to the Sangro River crossing point which had to be crossed to finish the route as a symbolic gesture to mark the end of the trail – the Allied Lines. Still overcast, but a little bit brighter than yesterday. We left Gamberale and climbed high and viewed the Sangro valley from a mountain ridge on our way to the village of Pietransieri for lunch. The journey took nearly five hours during which we had a very interesting talk from Tony Woods pointing out the dangers the escapers had faced trying to get to the Sangro River. In 1943 all the downhill slopes were all covered by mine fields and heavy machine guns from both sides. There was always the danger of being killed by the Allies as well as the Germans. On arrival at Pietraniseri at about 1400 we were met by the town band who led us into the village. 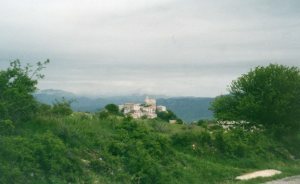 The walkers could be seen winding down from the mountain by people in the village. A very long line of walkers as far as the eye could see. It was a very emotional moment for the villager’s. The village had been raided by German troops because of the assistance the people had given to Allied escapers. They had gathered the villagers together and had machined gunned every man, woman and child who were in the village at that time. Only one child survived covered by her mother’s body. Many of the villagers were obviously moved and many of the veterans stood with them, arms around them as the walkers approached. Elizabeth Harrison consoled one elderly lady who was in tears, overcome by the fact that that so many had come to commemorate the atrocity in her village. The village gave us an enormous welcome and also provided a feast to supplement our lunchtime rations. Wreaths were again laid and speeches made. We were now well behind schedule and having said our goodbye’s we headed for our next village. After another hours walk over track and grass, we reached Roccacinquemiglia. More moving ceremony and wreath laying took place. Another splendid feast but we were now very late in our timings and regrettably, after a short time we had to move on. We took the old mule trail route from the village and started to descend from the high ground. Rain had now started to fall and our descent became very slippery, muddy and hard work. The front walkers were not too bad but towards the end of the line they were walking in deep mud created by the walkers in front of them. Everyone was however in good spirits and the Italian walkers could be heard singing. To many of the veterans this was reminiscent of the marches during the war when the partisans would burst into song after a successful operation. After another hour of walking we were nearing the Sangro River. On a previous recce the organisers had identified a suitable crossing point where the water was shallow and where it was thought the escapers had crossed. In 43/44 it was thought the depth was usually above four feet. Today however, we were lucky, as a dam had now been built up stream which controlled the water level further down. For us on this occasion, thanks to the dam, the level was no more than eighteen inches. The river was symbolically crossed. For many walkers with badly blistered feet their morale was exceedingly high as it must have been with escapers in the winter of 43/44. Remarkably, two of our veterans, Dominic Graham and Ray Sherk had walked all the way. Ray in the boots he used last time. Everyone now formed up and marched to the centre of Castel de Sangro, where at the finish point as the trail organiser I was asked to cut the finishing tape. Now following the band in to the centre of the town where again wreaths were laid and speeches made. There was an exchange of flags and berets by service units with our Italian friends. Addresses were swapped and walkers agreed to meet again next year. Following an evening of celebration, good food and good conversation we returned to Sulmona and the Europa Hotel, with many of our Italian friends, and the post trail celebrations continued until breakfast time the next morning. The hotel staff were kept very busy. The morning started quietly. Many drifting from the bar to breakfast. Others recovering from the rigours of the trail and the night before. A few free runners left in their cars to return home to England. Many went for a leisurely stroll around the very old town of Sulmona. At 1600hrs many of us gathered once again with local people for another ceremony at the war cemetery on the outskirts of Sulmona which had also been the starting point for the trail. Wreaths were laid on the memorial to four Italians who had been executed by German troops in October 43. They had been with the Resistance and helped escapers. It was a simple service and reflected the true purpose of the trail – to remember. In the evening a reception had been organised at the Europa Park Hotel in Sulmona to say thank you to the many Italians who had assisted in making the trail possible and for the helpers and their families who had assisted escapers on the run. Another excellent buffet was organised by Antonella, the hotel manager. Many of our Italian friends attended and Don McClarty who had spent his 21st birthday in PG78, at Sulmona, now spent his 79th birthday in the biggest hotel in Sulmona. He no doubt said 58 years ago that he would never return to Sulmona, but he was experiencing a reunion with friends and a number of helpers who had assisted in his escape. Bernard started playing his mandolin, the singing started, thus in a spirit of friendship and camaraderie did the first San Martino Trail come to an end. Thanks must go to our many Italian friends in Sulmona and the surrounding areas who, by their support, made the event possible. As they had done in 1943 and 1944, the local Italian people supported us, fed us, housed us and guided us on our way. We hope that the event served not only to commemorate the enormous sacrifices made by the Italian people in WW2, particulary the contadini, but also highlighted the little known contribution given to the Allied cause by the Italian people. The walk also endorsed the enduring friendships between Italians and the old Allied countries today. We all look forward to next year‘s event. For me and no doubt , many others, this evening is not without an element of emotion. However it is a pleasure and honour for me to be here today. On the 12th September 1943, with other colleagues, I broke out of Sulmona Camp to avoid being handed over to advancing German troops. Two or three days later I sustained a broken arm – the outcome is still visible today – and other injuries following a serious accident in the mountains. I had no option to surrender to a German patrol who took me to Sulmona hospital where I was admitted to receive treatment. To avoid going to Germany, I was there until escaping on 09th October 43. After several hair raising experiences, with assistance from a number of local people – to whom I shall be forever grateful – I arrived in Allied lines on 04th February 1944. Many individuals for many reasons cannot be with us during the next few days, but they will be in our thoughts. The San Martino Trail is an important part in commemorating and thanking in some small way, those individuals involved in assisting evaders and escaping POWs nearly sixty years ago. The route on this occasion – Sulmona to Castel de Sangro – has been designed for people to take part and finish in a comparatively easy organised event. It is not a challenge, but a commemorative event intended to be held annually and in future years,possibly on other appropriate routes – Sulmona being the focal point. These occasions should be looked upon as a walking memorial tribute to the people of the Italian countryside who assisted escapers and evaders so many years ago. If, during this, or future ‘Freedom Trails’ you start to swear and curse along the route, it may be helpful if you remember it was done under far worse conditions in the winter of 1943/44, by men not only hunted day and night by the enemy, but in unknown areas of dense forest, mountains, very adverse weather conditions, maybe with little or no food, and only melted snow to drink. There were no support teams, cooking facilities or vehicles – except vehicles with enemy troops, who were always ready to assist in your re-capture. Circumstances could change very rapidly, often requiring for immediate and very risky decisions having to be made. Having made these brief observations, I would like to once again emphasise that it is an honour, and gives me great pleasure to present this engraved visitor’s book to the Mayor of Sulmona. The intention is that that it be carried along the route – on this occasion from Sulmona to Castel de Sangro – where it will be signed by all walkers of all nationalities who start and then complete the route. The book will then be handed over to the Mayor of Sulmona for safe-keeping until the next event in 2002. On the evening of the 10th of September 1943, the word finally got through to the occupants of PG 59 Servigliano in the Marche area of Italy. After various discussions a group made a hole in the perimeter brick wall and so the walk to freedom began. On the evening of the 10th of September 2003, in the comfort of a nearby restaurant, the participants of the San Martino Freedom Trail – veterans, families of veterans, walkers and an Italian film crew gathered with local residents and a convivial evening of recollections began. Personal stories were related to the audience and the film crew, working with Denys Symmonds, a former Chieti camp resident, quietly recorded interviews with the veterans present. Keith Killby, Bernard Collier, Jim Bourn, Mick Wagner and Lawrence Bains, all made significant contributions for an Italian documentary. On the 11th a bright sunny and warm morning everyone gathered at the entrance to the ‘Parco della Pace’ in Servigliano – a sports complex and public park set within the walls of the former POW camp, and now also home to the Cassa della Memoria Project. Keith Killby, attired in his original sand coloured beret, began to relate how the exodus from the camp was achieved to an enthralled audience. The Mayor made a speech and a poppy wreath was laid at the gates to the park near two memorial tablets. The assembled company, including the British Consul from Florence, Moira McFarlane, local dignitaries and members of the veterans association, processed into the main square of Servigliano, where a formal wreath laying took place followed by a blessing by a priest and the walk began. It was led out via the main road, to a railway bridge that afforded access to the ‘white road’ that led west towards the Sibillini Mountains. The veterans, non-walkers, had an hour or two to stroll around the medieval heart of Servigliano and the back-up team moved on, collecting meals. Then everyone met at the house of the Barchetta family where Keith Killby first received assistance. After a ‘sack lunch’ – the local name for a pre-packed meal – and some home grown ‘vino cotta’ (cooked wine) everyone gathered at the old farmhouse and Keith continued with his narrative. The walkers then got under way and, after a morning of relatively level ground, the first steep incline was on them. They all made it up to Monte San Martino (from where the Trust derives it name) where a private viewing of the Crivelli altar pieces had been arranged. This was followed by a fabulous tea organised by the Nuns of the convent and a talk on the history of the Order. We then all paraded in the main square of the town for the formal speeches of the Mayor, Provincial Representative and others. Next, everyone headed for dinner at the Lago san Ruffino, which with the aquatic display accompanied by thunder & lightening was quite spectacular – al fresco dining with running water across the patio. Then it was back to the Hotel Montanaria (4 star) for a well-earned rest. Friday morning saw the walkers on an early start and a return to Monte San Martino, for a route that would take them back down the hill to the Lago San Ruffino, a rest stop with the rest of the travelling party, and around the lake via more white roads (good Landrover driving) to Amandola and a short ceremony at the local War Memorial and lunch. Under the watchful eye of local guide, and one of the planning group, Guiseppe Millozzi and walk leader Brian Lett, the happy wanderers headed for Sarnano. They arrived to a well organised civic memorial celebration and refreshments stacked in the back of the Landrover. The walkers and all were shipped back to the hotel, for another marathon of good food and other regional produce. Saturday morning started overcast with rain about, but with the assistance of a local Club Alpino Italia guide they all decided that it was walking weather, so the intrepid group were conveyed up to a higher start point and left in the care of the guide for the day. The veterans began a tour of local places of interest with personal recollections from those who had travelled these hills 60 years before. Saturday evening saw the whole party gathering for a formal dinner. We were privileged to be addressed by Carlo Orlandini – a past President of the British chamber of Commerce for Italy – on his own experiences in the locality during the War, as a guide to the SAS. Many personal discussions took place in the relaxed atmosphere. Not a very early night! Sunday dawned and saw a walking group set off again for another challenging day, with a rendezvous with the rest of the group just after midday, at a memorial to 13 partisans at Cessapalombo. The support team then travelled on to Sulmona. There we met up with James Williams and his sons Ed and Henry who were following up leads on James’ father, Brig. Stephen Williams RA, who had been a resident of Villa Orsini in Sulmona. Bernard Collier was able to provide a lot of history of the area for the family. Assistance was also at hand from Ann and Nino Fontecchio who had helped in the tracing of Williams’ ‘helper’ family. A reunion was planned for the Monday afternoon, as the rest of us departed. Tony and Louise Woods were also in the area, having travelled down from the celebration at Fontanellato. We returned north and had a very enjoyable dinner with the remaining veterans, who had managed to re-establish contact with their helper families and visit various places of significance to their own stories. The event marked the date of the 60th Anniversary of the Italian Armistice, the start of a huge humanitarian episode where so many were helped by a lot of very ordinary people who themselves had very little – nationality, creed or colour was no bar – pure Christian charity was given to those who needed it. This help allowed many to return to Allied lines and then their families. In my case it allowed my father to return to New Zealand and eventually meet my mother. The whole event was the culmination of an idea expressed several years previously and the plan was put in place with the assistance of the Millozzi family and Luigi Pighetti who acted as local co-ordinator (and demonstrated to all that wished to see at first hand, Italian driving techniques!) and proved yet again that friendships forged in times of adversity prevail.